Want to bring something fun to work or school for Valentine’s Day? These strawberry brownies from Kevin Lynch of Closet Cooking can be made for any occasion. But we especially like the heart-shaped effect of halved strawberries for “love” occasions: Mother’s, Father’s, Valentine’s, anniversaries, etc. You can adapt the idea to your favorite brownie, or use his. Wwe tweaked his a bit, using 2/3 cup sugar instead of 3/4 cup, since the chocolate topping is so rich; and used white chocolate for the top for color and flavor variation. For a step-by-step photos and substitutions for gluten-free, vegan, etc., see the original article. 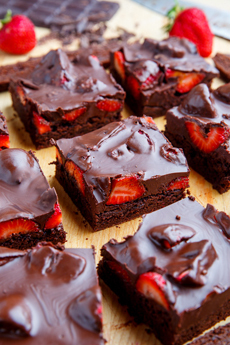 Chocolate covered strawberry topped fudge-y brownies! The strawberry “hearts” make these brownies easy to love (photo courtesy Closet Cooking). 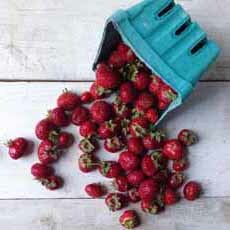 Use smaller strawberries for more of a heart shape (photo courtesy Quinciple). 1. GREASE an 8-inch-square baking pan. Optionally, line it with foil or parchment, overhanging to make lift-up and clean-up easier. Preheat the oven to 350°F. 2. COMBINE the chocolate and butter in a sauce pan over medium heat; melt, stirring frequently. Remove from the heat and let cool. 3. MIX the sugar into the eggs. In another bowl, sift the flour, baking powder and salt together. Blend the melted chocolate into the egg mixture, followed by the flour mixture. 4. POUR the batter into the prepared baking pan and bake about 20 to 25 minutes, until a toothpick inserted into the center comes out clean. Remove from the oven. 5. SPRINKLE the strawberries on top of the brownies. Melt the chocolate over medium-low heat on the stove or in a microwave. Pour it over the strawberries and let cool until the chocolate is set, 30-60 minutes.